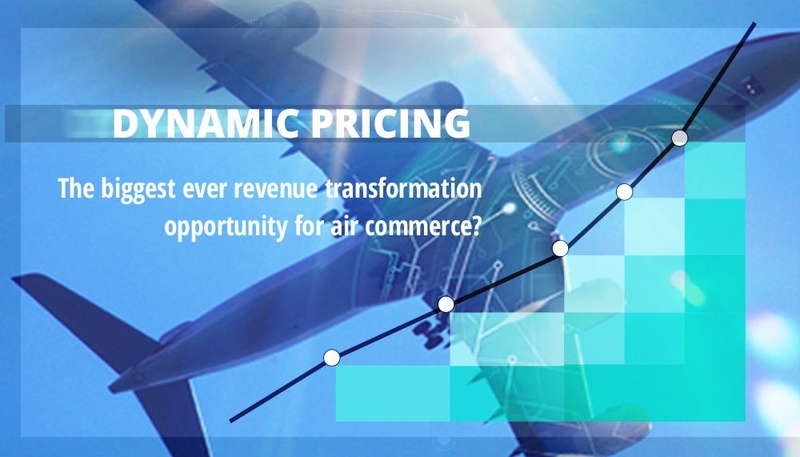 Dynamic Pricing: Is this the biggest ever revenue transformation opportunity for air commerce? The move away from GDS-centric distribution towards NDC opens a wealth of opportunity for airlines who are bold enough to embrace offer transformation. Freedom from legacy fare filing and 26 booking class constraints means that airlines can radically innovate how they create, price, and merchandise both flights and ancillaries. A market research report published by Deutsche Bank on February 6, 2018 about the European Airline Industry predicts that flexible pricing and a greater ability to sell ancillaries has the potential to increase network airline EBIT by 20%. The industry has witnessed the steady growth of airline ancillary revenue for more than a decade, with $82B projected for 2017. How will the industry keep that party going? Enter Dynamic Pricing, which is increasingly regarded as the next big – perhaps the biggest ever – revenue transformation opportunity for air commerce. Dynamic Pricing - where to start? The best way to start a journey is often with a single step, and many airlines are doing just that by crafting first-round dynamic pricing initiatives based on a filed fare. Pricing optimization algorithms act on rules at the heart of a pricing engine to manipulate the starting ATPCO fare with ‘dynamic’ results, leading to the creation of better competing price combinations. The downside to this approach is that the 26 booking class buckets force staggered jumps in price. This is not appealing to Revenue Management managers seeking a smoother curve with more nuance in pricing variability. True adventurers in airline dynamic pricing are currently going one step further by breaking free from the 26-booking class restriction and with good reason. By starting with the bid price or market fare generated in the Revenue Management system, pricing logic is applied earlier in the process and without the limitations of the 26-bucket problem. The RM manager then has infinitely more opportunity to fine-tune a customized offer, which can be further discounted, bundled, or promoted. An airline-controlled Pricing Engine that can operate such a linear pricing model unlocks considerable more opportunity for airlines to earn more revenue and delight their customers. I asked Karl Isler, former Head of Strategy and Operations Research for Pricing, Revenue Management, and Distribution at Swiss Airlines about Dynamic Pricing. “Dynamic Pricing has become a bit of a synonym for pricing in the new world without filed fares or booking class restrictions. Substantial revenue gains are expected from relaxing this restriction,” he said. 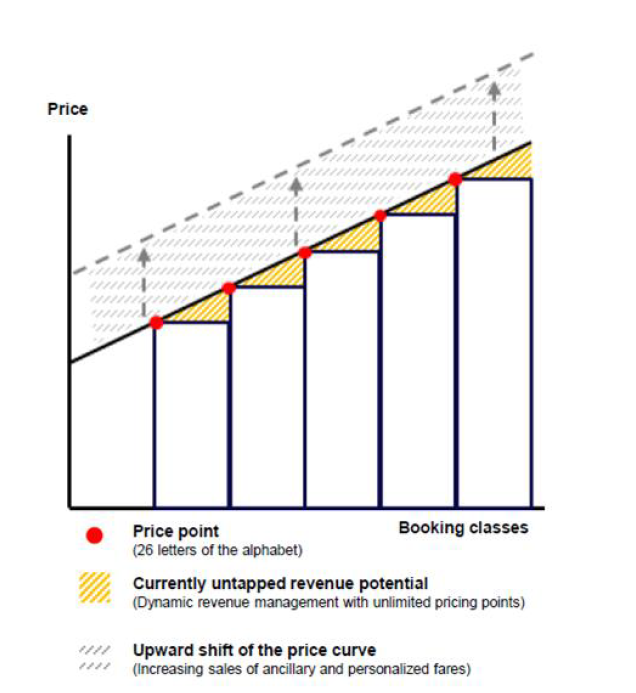 By eliminating the reliance on booking classes, airlines can engage in a pricing strategy that’s more akin to a curve rather than incremental jumps in price, per the illustration below. As you can see in the example above, fully elastic dynamic pricing takes advantage of untapped revenue potential from both flights and ancillaries. Data has always played a significant role in airline revenue management. But with Artificial Intelligence and Machine Learning, data science is poised to make a significant impact. Machine Learning is not new. It has been around for several decades. What has changed is that it has become a commodity, with published algorithm libraries that are now readily accessible. Machine Learning comes into its own when presented with high volumes of data and is set to the task of validating theoretical models and making quick decisions. “Larger volumes of rich customer data are now available, and that’s fertile ground for Machine Learning algorithms and Artificial Intelligence techniques. Artificial Intelligence, specifically Machine Learning, has already begun to make an impact on many fields, from fraud protection to financial market analysis, and will also make an indelible mark on air commerce,” commented Karl Isler. As Machine Learning is most effective when it’s narrowly focused on use cases, it lends itself to merchandising of fares and ancillaries, as there is a finite (although very large) number of possible merchandising decisions (product, placement, and price). It’s also the perfect candidate for Dynamic Pricing. Machine Learning will form the basis for Predictive Analytics for Revenue Management. Soon, it will be possible for systems to not only predict an outcome, but also prescribe the best action to deliver the desired results. Combining this capability with an airline-controlled Offer Engine capable of processing billions of real-transactions performantly and inexpensively, will move the needle in terms of revenue opportunity and unleash what many are calling New Gen Revenue Management. No other discipline has a greater opportunity to make the most of this brave new world than airline Revenue Management. Karl Isler, predicts that airline Revenue Management is on the cusp of fundamental change. “Revenue Management will become more diverse as the focus is now not only on price, but all elements of the offer,” said Karl Isler. With all the technology elements, personalized bundles, Dynamic Pricing, and Machine Learning now in place, what’s holding Revenue Management back? Karl Isler thinks that airline Revenue Management is at an inflection point. “The biggest challenge is how to transition to the new distribution model, yet still live in the old world. How can one manage living in both worlds for the transitional period?,” said Karl Isler. Which airlines will come out in front of this dynamic pricing revolution? Karl believes “airlines which engage in NDC and are open and active to implement new ways of doing pricing, will stand out from the pack”. Want more insight on this topic? Dynamic pricing and compelling shopping experiences at lower costs is the promise of new generation air shopping and pricing. Figuring out what you need to know can be a challenge - until now. Farelogix has produced the New Generation Shopping & Pricing Primer that will bring you quickly and easily up-to-speed. To download your copy, click the button below. Air Shopping and Pricing - What's Going On?